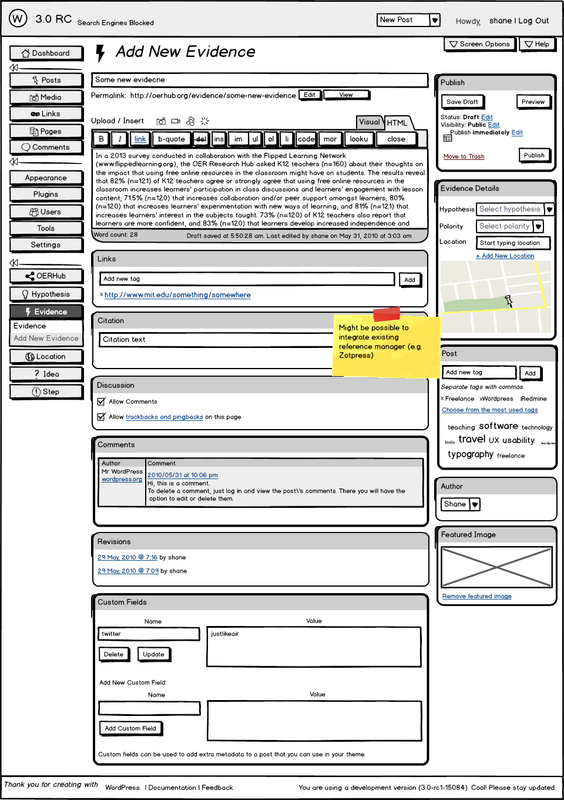 Fortunately rather than creating the custom post type templates from scratch Francis Yaconiello’s has published a plugin template to do this. For this project we need three custom post types to enter data for hypothesis, evidence and location mapping to the relationship diagram shown above. To avoid duplication these templates use additional templating to make it easier to add custom fields. 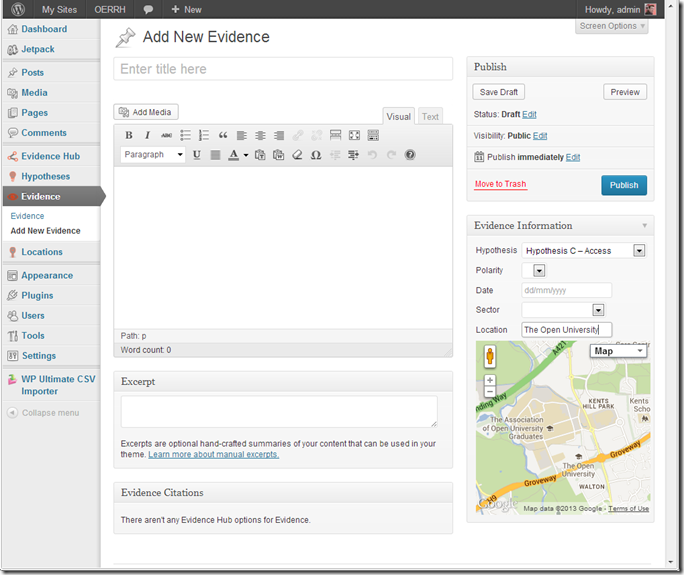 The result is shown below with the current ‘Add New Evidence’ screen. 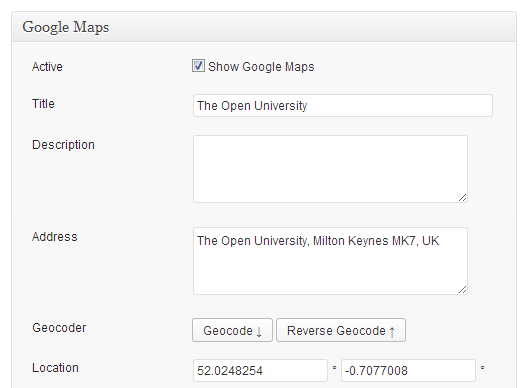 One particular challenge was to find an easy way for users to attach location data to evidence. Rather than getting users to select a location name from a long list a simple location lookup which queried the existing location custom post types. 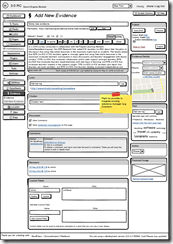 This component uses, in part, the Pronamic Google Maps plugin which is included in this plugin as a software library. This route has been chosen to remove the dependency on other plugins being installed on the site which could be an issue for multisite deployment. The downside is that this component has become orphaned from the Pronamic updates. This comes with an increased risk given the dependency on the Google Maps API. The mitigating factor is the Pronamic’s plugin stores the geodata in a way that it can be used by other plugins and mapping services. Another reason for choosing to ‘bake in’ the Pronamic’s plugin is that with a line of code we can include geo options within the location custom post type. This option includes the geo-encoding and reverse geo-encoding of addresses making data entry easier. 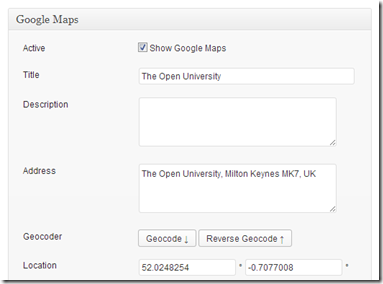 To save staff time in having to create new locations for evidence data has been imported from the evidence hub for open education using the WP Ultimate CSV Importer Plugin.